EXECUTIVE SUMMARY “Geo Erin” Co., ltd has been retained by “Sod Gazar” Co., Ltd to prepare a Technical Report on the Huh Tolgoi (Blue Hill) CaF2 metasomatite deposit of the Huh Tolgoi Project located at Sukhbaatar, Mongolia. The purpose of this report is to disclose a current estimate of the Mineral Resources. “Geo Erin” worked at the property in 2009 and 2010. In this report, “Geo Erin” Co., ltd reports on the Mineral Resources of the Huh Tolgoi CaF2 metasomatite deposit of the Huh Tolgoi (Shanagan) project. The Huh Tolgoi Property is an exploration property. Sod Gazar holds a mineral exploration licence (9964X) covering a total area of approximately 1,960 ha. The property was issued to Sod Gazar on June 8, 2005, and expiration date is on June 8, 2011, but it could be extended for three more years until 2014. All fees and other holding costs related to the Huh Tolgoi Property are paid by Sod Gazar, and there are sufficient assessment work credits to keep the property in good standing until June 8, 2011. In April 2011, “Reserve Estimation of Huh Tolgoi Fluorspar Deposit” is going to be discussed and registered to Mongolian Mineral Resources Authority’s Reserve Counsel. After this discussion, the property is going to be a mining license. Mining license should be valid for 30 years at least. The Huh Tolgoi Property is located at the distance of 70 km east of the Sukhbaatar subprovince of the Sukhbaatar province and 18 km west of Huut Coal Mine. The Sukhbaatar subprovince, adjacent to the town of Huh Tolgoi Deposit (approximately 5000 people). The property is situated approximately 600 km (straight line) east of the Ulaanbaatar Capital City. There is no regular commercial air service to and from Huh Tolgoi deposit and Sukhbaatar subprovince. Access to the Huh Tolgoi Project area is by paved roads (380 km) and local dirt roads (290 km). The topographic elevations on the Huh Tolgoi Property range from approximately 1150 m to 1170 m, and the property lies within an area of low relief, ranging from 1 m to 20 m. The topography of the area includes steppe and rolling hills extending into relatively flat terrain with moderate vegetation, which is typical of Eastern Mongolia. The climate in eastern Mongolia is with 4 seasons. The mean temperature during the winter months is -20°C, ranging from -10°C to -30°C, and the mean temperature during the summer months (from June to September) is 20°C, ranging from 10°C to 30°C. The average annual precipitation ranges from 100 cm to 150 cm. Exploration in the Huh Tolgoi area is affected by the typical seasonal climatic variations, but drilling may be carried out most of the year. Local infrastructure is available at Baruun-Urt town, the largest town on the Sukhbaatar province, with a population of 60000, located 80 km southwest of Huh Tolgoi. There is no infrastructure at the site, and electrical power for exploration works is supllied by generators. The Town Baruun-Urt town is connected to the main Eastern Mongolia Power grid. Water, both industrial and potable, is pumped from nearby water wells. The area is covered with high grass typical in Eastern Mongolian Steppes, with locally abundant outcrops. Vegetation consists predominantly of grasses typical of the Steppe Region in Eastern Mongolia. Areas of outcrop are smoothed by denudation process. Overburden cover ranges from one metre to four metres. Exploration for fluorite deposits in the Huh Tolgoi area on the Sukhbaatar subprovince started in the 1990 by Bayarsaikhan and resulted in the discovery of fluorite on an outcrop by a local resident near the Huh Tolgoi metasomitite bodies. It was called Shanagan Fluorspar Occurrence after Bayarsaikhan in 1990. 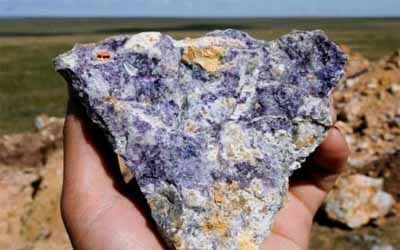 The earliest recorded mining activity was not detected at Huh Tolgoi Fluorite deposit. The Huh Tolgoi Fluorite deposit is situated within the northeast trending linear faulted belt of the Gal Shariin ore region of Dornod (Eastern) Mongolian metallogenic belt classified by V.A.Kuznyetsov (1985). The Huh Tolgoi Fluorite deposit resource calculated area is 300 m wide and 500 m long on land. It is continued to the North East and which is potential for further exploration. The regional geology is characterized by Lower Devonian limestone, silicified slates, sandstone and siltstone lenses within muddy slate, Lower Permian acidic effusive rock unit and subvolcanic intrusions, and Lower Cretaceous sedimentary and volcanic rock formations. The fluorite ore bodies lie in northeast trending fault zones by edge of volcan-plutonic complexes of Cenozoic and Mesozoic era. Geological settings of the deposit is in complex structured zone of fault systems, weakly denudation processed, outcropping is not distributed evenly and rubbles exist mostly on top of the hills. It is assumed that, Fluorspar mineralization is developed in 1.5X0.6 km sized, latitudinal volcanic caldera characterized by siliceous tuff and breccias and the area interpreted on satellite image as roughly dark zone separated by other rock units. These fluorspar mineralized tuff-breccias are occur in sericitized and silicified muddy slates with barely marbled limestone lenses, and ore bodies are deformed into small blocks and displaced by longitudinal and northwest trending fault systems visible on satellite images. There are various thickness (0.05-0.1 cm) of quartz veinlets occur within slates. In the eastern edge of the ore zone, there is a skarn with garnet body occurs as a small hill in dimension of 0.5X0.4 km. In 1990, J.Bayarsaikhan, who is discovered the occurrence, described the origin of the deposition of fluorspar and skarn with garnet as contact metamorphism in metasomatite process affection into the limestone lenses in Devonian muddy slates. In the southern and eastern side of the ore zone, there are lower Permian acidic rhyolite, rhyodacite and their tuffs, lithcrystalloclastic tuff and rhyodacite porphyry subvolcanic bodies belong to Burentsogt formation lies, and in the northern side of the ore zone, there is lower Permian medium grained leucocratic granite intruded into fluorspar ore bearing slate occurs. To the southwest of the ore zone, lower Cretaceous Tsagaantsav formation consists of clasts of Permian effusive and intrusive, and upper Cretaceous andesitic tuffaceous sedimentaries occur. Definite outcrop contacts not determined and mostly interpreted from satellite images to draw regional geological map. The Mineral Resources at Huh Tolgoi have been estimated at a mineralized zones and a minimum thickness of 0.5 m of ore bodies and at deluvial rubbles deposition. The Indicated Mineral Resources total approximately 1’227’508.8 tonnes of ore at an average grade of 29.0% CaF2 and 355’991.4407 tonnes of acid CaF2 at grade of 99.99%. Table 3. Below 15% CaF2 resource has been calculated as 138'728.8 tonnes of ore at an average grade of 10.38% CaF2 and 14'407.263 tonnes of acid CaF2 at grade of 99.99%. If include these low graded material into total deposit resource, ore amount will be 1'366'237.6 tonnes at 27.11% CaF2 and 370397.9 tonnes of acid CaF2 at grade of 99.99%. “Geo Erin” worked at the property in 2009 and 2010. Notes: 1. Mineral Resources are estimated at a mineralized zone and a minimum thickness of 0.5 m. 2. Average density of mineralized rock is 2.8 t/m3. 3. Tonnage and average grade numbers are rounded. 4. Mineral Resources Estimation grade distribution method is Inverse Distance Weighting. 5. Indicated Resource Search Radius was 100X50X10 m, and Inferred Resource Search Radius was 300X150X50 m.
Past exploration at Huh Tolgoi has come with the numbers of ore bodies subparallel to each other. To the east of the deposit area, fluorite occurrences existing are potential for further exploration. The current price for acid grade fluorspar is within a range from US$300 per tonne of CaF2 to US$350 per tonne of CaF2, and it is within a range from US$160 per tonne of CaF2 to US$175 per tonne of CaF2 for metallurgical grade fluorspar. Sod Gazar plans to produce acid grade fluorspar at Huh Tolgoi fluorspar deposit. Sod Gazar assumes the price of fluorspar to increase gradually over next few years, and maintain the average price of US$300 per tonne of CaF2 for acid grade fluorspar. To the east of the deposit we discovered 2 ore bodies extending about 1000 m by NE70 azimuth. The ore body continuous for 1000 meter and 3-5 m thick. 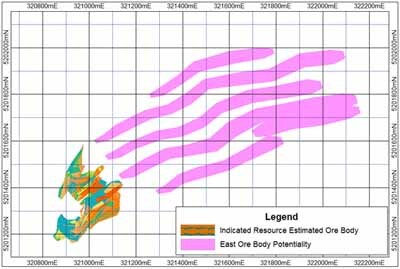 The inferred resource has been calculated for the ore bodies at 28.5% average grade of the assay results. Volumes of the ore bodies is 144526.8 m3 and ore amount is 404675.05 tonnes at grade of 28.05% CaF2 and 115332.4 tonnes of acid CaF2 will be discovered.